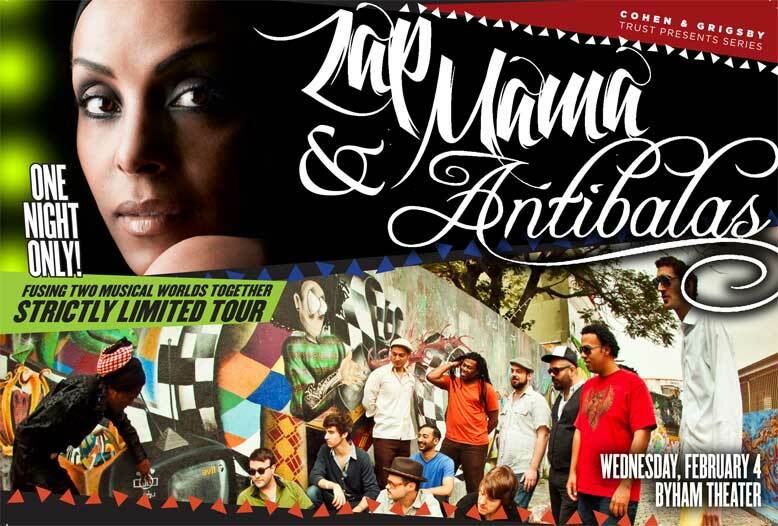 BAP OFFICIAL E-BLAST - ZAP MAMA AND ANTIBALAS FOR ONE NIGHT ONLY, WEDNESDAY, FEBRUARY 4TH, 2015 AT 7:30PM AT THE BYHAM THEATER! 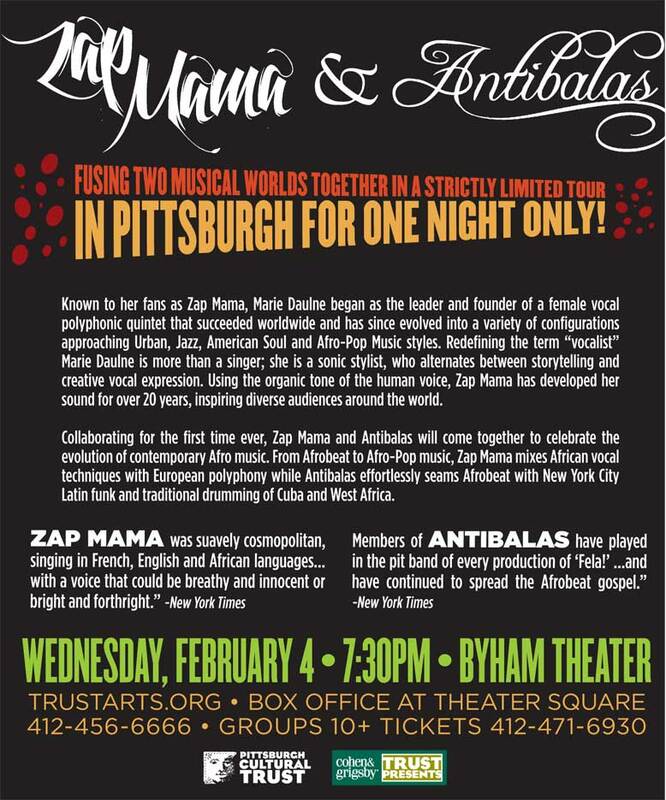 ZAP MAMA AND ANTIBALAS FOR ONE NIGHT ONLY, WEDNESDAY, FEBRUARY 4TH, 2015 AT 7:30PM AT THE BYHAM THEATER! Known to her fans as Zap Mama, Marie Daulne began as the leader and founder of a female vocal polyphonic quintet that succeeded worldwide and has since evolved into a variety of configurations approaching Urban, Jazz, American Soul and Afro-Pop Music styles. Redefining the term "vocalist" Marie Daulne is more than a singer; she is a sonic stylist, who alternates between storytelling and creative vocal expression. Using the organic tone of the human voice, Zap Mama has developed her sound for over 20 years, inspiring diverse audiences around the world. Collaborating for the first time ever, Zap Mama and Antibalas will come together to celebrate the evolution of contemporary Afro music. From Afrobeat to Afro-Pop music, Zap Mama mixes African vocal techniques with European polyphony while Antibalas effortlessly seams Afrobeat with New York City Latin funk and traditional drumming of Cuba and West Africa.